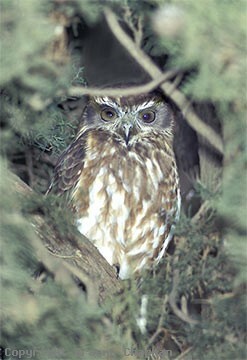 Certainly the most frequently heard call of all the owls in Australia, the familiar two-note call of the Boobook is widely known as "mo-poke". This has led to some confusion with the Tawny Frogmouth which is often called a "mopoke", but the usually heard call of the frogmouth is a soft repeated "oom" nothing like a Boobook. Southern Boobooks are quite widespread in Australia and occur virtually everywhere there are holes for them to nest or roost in. 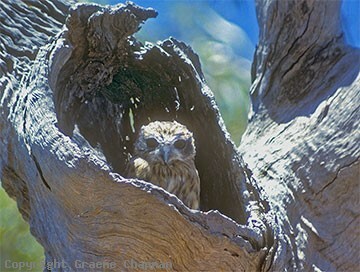 Nesting birds mainly use tree hollows, but cliff holes, caves or even outhouses are other known sites. 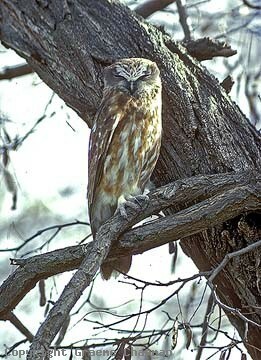 By day they roost in tree holes or sometimes in thick vegetation. If you ever hear a group of various birds making a lot of noise near some thick vegetation the chances are they've discovered a roosting owl, likely a Boobook. 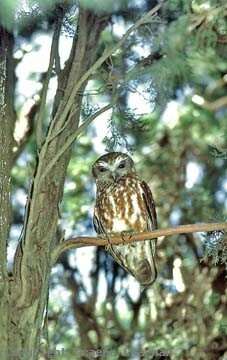 Southern Boobooks are our smallest owl but they vary a lot, both in size and appearance. There are many subspecies throughout Australia and also overseas. Until recently, the smallest of these was the form from Tasmania, but new research has suggested they should be reclassified with the very similar Ninox novaeseelandiae from New Zealand, Lord Howe Island and Norfolk Island. That leaves the small, dark form from N.Q. rainforests, subspecies lurida, as the smallest of the Southern Boobooks - in the 1926 R.A.O.U. Checklist it was regarded as a species, the Red Boobook Owl, but until we know more about this form, its exact status will remain in question. Research on nocturnal birds is always difficult, so on the whole little is known. A single radio-tagged Southern Boobook male was found to occupy a territory of approx 100 Ha and his colour-banded neighbour 50 Ha, but estimates from other areas have ranged as low as 30 Ha. They are generally regarded as sedentary, living as pairs in permanent territories but some migration occurs in winter. Although most observations are of single birds - the other one is probably just out there in the dark somewhere! They feed by watching from a vantage point and pouncing, but also in flight such as around street lights for insects. Small mammals (mainly mice), birds, frogs, lizards and large insects form part of the diet.